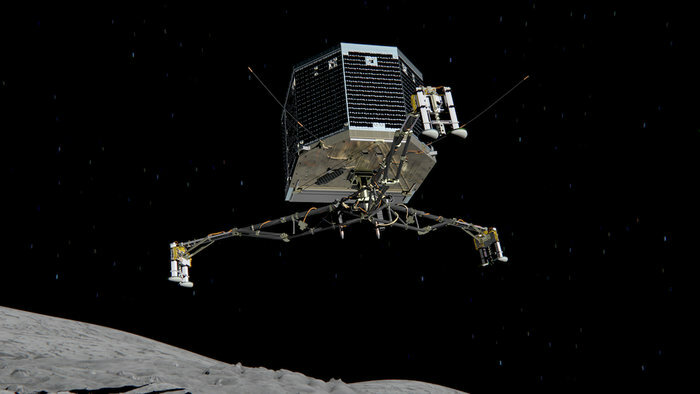 September 26, 2014 – The European Space Agency’s Rosetta mission will deploy its lander, Philae, to the surface of Comet 67P/Churyumov–Gerasimenko on November 12. Over the last two weeks, the flight dynamics and operations teams at ESA have been making a detailed analysis of flight trajectories and timings for Rosetta to deliver the lander at the earliest possible opportunity. Two robust landing scenarios have been identified, one for the primary site and one for the backup. Rosetta’s lander Philae will target Site J, a region on the comet that offers unique scientific potential, with hints of activity nearby, and minimum risk to the lander compared to the other candidate sites. The area also receives sufficient daily illumination to recharge Philae and continue surface science operations beyond the initial 64-hour battery-powered phase. Site J is on the ‘head’ of the comet, an irregular shaped world that is just over 4 km across at its widest point. The decision to select Site J as the primary site was unanimous. The backup, Site C, is located on the ‘body’ of the comet. Since it began orbiting Comet 67P/Churyumov–Gerasimenko, the Rosetta mission has been conducting an unprecedented scientific analysis of the comet, a remnant of the Solar System’s 4.6 billion-year history. The latest results from Rosetta will be presented on the occasion of the landing, during dedicated press briefings. The main focus to date has been to survey 67P/Churyumov–Gerasimenko in order to prepare for the first ever attempt to soft-land on a comet. For the primary landing scenario, targeting Site J, Rosetta will release Philae at 08:35 GMT/09:35 CET at a distance of 22.5 km from the center of the comet, landing about seven hours later. The one-way signal travel time between Rosetta and Earth on November 12 is 28 minutes 20 seconds, meaning that confirmation of the landing will arrive at Earth ground stations at around 16:00 GMT/17:00 CET. If a decision is made to use the backup Site C, separation will occur at 13:04 GMT/14:04 CET, 12.5 km from the center of the comet. Landing will occur about four hours later, with confirmation on Earth at around 17:30 GMT/18:30 CET. The timings are subject to uncertainties of several minutes. 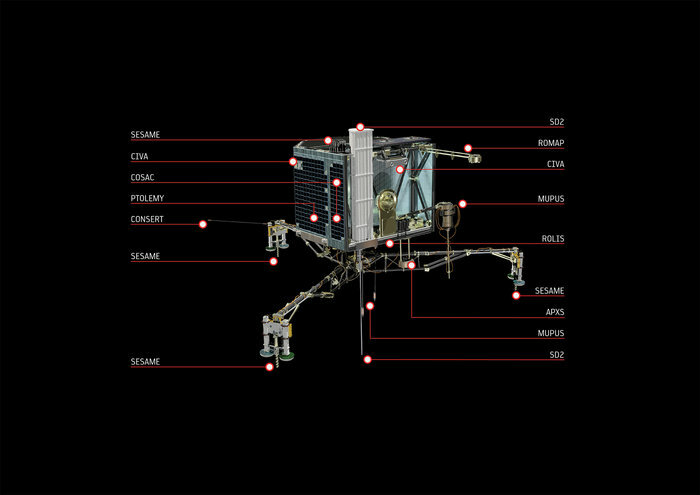 Once deployed from Rosetta, Philae’s descent will be autonomous, with commands having been prepared by the Lander Control Center at DLR, and uploaded via Rosetta mission control before separation. During the descent, images will be taken and other observations of the comet’s environment will be made. Once the lander touches down, at the equivalent of walking pace, it will use harpoons and ice screws to fix it onto the surface. It will then make a 360° panoramic image of the landing site to help determine where and in what orientation it has landed. Final confirmation of the primary landing site and its landing scenario will be made on October 14 after a formal Lander Operations Readiness Review, which will include the results of additional high-resolution analysis of the landing sites conducted in the meantime. Should the backup site be chosen at this stage, landing can still occur on November 12. A competition for the public to name the primary landing site will also be announced during the week of October 14. The Rosetta orbiter will continue to study the comet and its environment using its 11 science instruments as they orbit the Sun together. The comet is on an elliptical 6.5-year orbit that takes it from beyond Jupiter at its furthest point, to between the orbits of Mars and Earth at its closest to the Sun. Rosetta will accompany the comet for more than a year as they swing around the Sun and back to the outer Solar System again. Boulder’s Southwest Research Institute (SwRI) Space Science and Engineering Division built one of three instruments aboard Rosetta that is funded by NASA. The instrument, known as Alice, is probing the origin, composition and workings of the comet, gaining sensitive, high-resolution compositional insights that cannot be obtained by either ground-based or Earth-orbital observations. The ultraviolet wavelengths Alice observes contain unique information about the composition of the comet’s atmosphere and the properties of its surface. 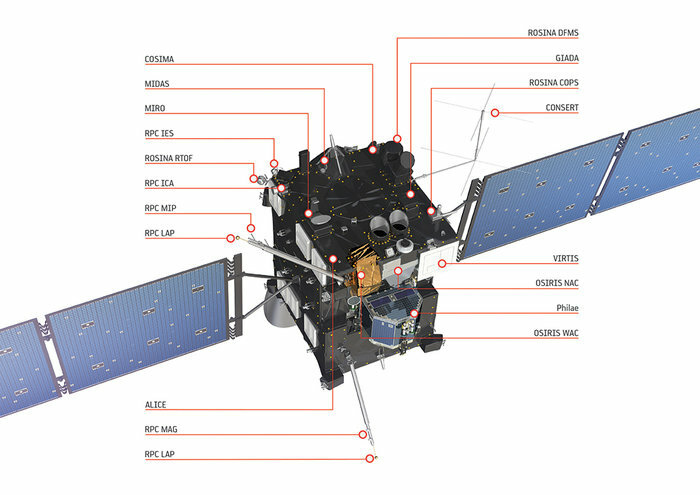 The analyses made by the Rosetta orbiter will be complemented by the in situ measurements performed by Philae’s 10 instruments.